According to reports, the JKBOSE Kashmir Division result for Class 11th will also be released soon on the official JKBOSE. JKBOSE Results 2018: The JKBOSE Results 2018 for Class 10th Kargil Division has been released on the official website – jkbose.ac.in by the Jammu and Kashmir State Board of School Education on Tuesday, January 22. The Jammu and Kashmir State Board of School Education (JKBOSE) has declared the Class 10 Kargil Division results for Annual Regular/ Private candidates. 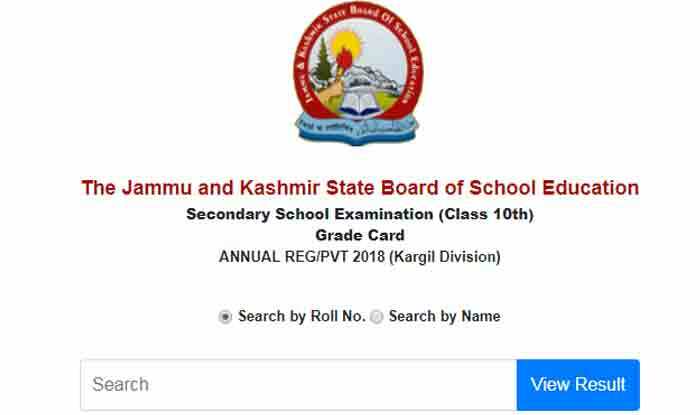 Candidates who have appeared for JKBOSE Kargil Division Class 10 examination can check their results from the official website by entering their roll number or by their name in the form available on the website. Step 1: Visit the official website- jkbose.ac.in. Step 2: On the homepage, click on ‘Class 10 Kargil division winter zone results’. Step 3: A new window will open. Enter your roll number or name and submit. Step 4: Your result will be displayed on the screen. Step 5: Download the same and take a printout for future reference. Hadia Noor of Government Girls Higher Secondary School, Kothibagh, has topped the merit list in Arts by scoring 493 out of a total of 500 marks and her schoolmate Tanzeela Hassan scored 492. Towseef Shafi of Government Higher Secondary School, Srigufwara, Anantnag, scored 491 followed by Zaira Shafi of the Kothibagh school, scoring 491, while Irtiza Jan of Government Girls Higher Secondary School, Amira Kadal, scored 490. According to reports, the JKBOSE Kashmir Division result for Class 11th will also be released soon on the official JKBOSE. Earlier, the JKBOSE had released the Secondary School Examination (Class 10th) results for the Leh Division.